Greyhounds come in a lot of different colors. Because they were always selected for speed instead of color it has long been said that a good greyhound never has a bad color. Since there were no bad colors, colors were not eliminated from the greyhound gene pool. And because the breed has existed for millennia, and was crossed with a variety of native dogs, many colors were introduced to its gene pool. They are all still there. Greyhounds come in nearly every known dog color with the exception of merle and black and tan. This makes whelping greyhound litters great fun as each new puppy can be a different color. It also makes it a bit of a challenge to understand greyhound color genetics well enough to predict the possible colors in a litter. Every dog is born with seventy-eight pairs of chromosomes that determine whether he will grow up to be a greyhound or a collie. In each pair of chromosomes one is received from the sire and one from the dam. Strung along each chromosome are genes which determine every aspect of the dog. A gene’s location along the chromosome determines what characteristics it controls. Coat color is controlled by pairs of genes that are located in eight different locations along the chromosomes. To identify the locations they are given letter designations. The letter designations of the genes that control color are A, B, C, D, E, N, S, and T.
If a dog receives a matching gene from each parent at a location then that gene pair is called homozygous (homo means same and zygous means gene). If a dog is homozygous for a color then it will be that color and can only pass on to its offspring a gene of that color. The exciting part of genetics comes if a dog receives different genes from each parent. If a dog has one gene for black and one gene for sable red, what color will it be? First it is said to be heterozygous (different genes). The color of the dog will be determined by which of the two unmatching genes is dominant over the other. The most dominant gene controls the dog’s appearance. At each gene location all the possible genes that can fit into that location are called alleles. These alleles are all given the letter of the location that they fit into. The most dominant allele of a series is identified by a capital letter, while the progressively more recessive genes are given small letters with superscripts to tell them apart. Once we have the genes identified we can chart greyhound colors just like Gregor Mendel’s short and tall pea plants. What do those capital letters mean? Knowing what the letters mean make genetic terminology easier for the non-geneticist to understand. The location letters: “A” stands for agouti which is the wild wolf color. (Greyhounds don’t have this, but if they did, it would be on the A locus.) “B” stands for black-brown; the recessive bb turns black hairs to brown. “Cch Cch” stands for chinchilla. “D” stands for blue dilution; the recessive dd produces blue dilution. E stands for black extension as the genes in this series affect the production of black pigment. “S” stands for spotting; the recessive ss produces white dogs with colored spots. N is a term I assigned for brindle with the recessive nn meaning no brindle. “T ”stands for ticking. The superscripts that tell the alleles apart: sable means black and is indicated by “s,” so As is black. Sable red is called yellow (indicated by “y”) so sable red is ay. Chinchilla is “ch,” so cchcch produces the Chinchilla effect. In the spotting series: “i” stands for Irish marked, “p” stands for particolor, and “w” stands for extreme-white. One difficulty in discussing colors is that owners use color terms that describe the dog’s appearance instead of its genetic coloring. Genetic red brindles are referred to as black brindles if they have a lot of stripes, or seal brindles if the brown color is a dull brown instead of red. But whether the red is dingy, brown or hardly shows at all, these dogs are still genetically red brindles. All greyhounds are one of two basic colors: black or sable red. These are determined by gene pairs at the A location. The genes that will fit into the A location are As (black) and ay (sable red). As is dominant to ay, so the sequence is written from most dominant to most recessive as As, ay. At each locus a puppy receives one gene from each parent. If a puppy has AsAs genes it will be black. If it has Asay genes then it will again be black because the black As is dominant over ay sable red. If the puppy receives an ay gene from each parent then it is ayay and is sable red. The sabling in sable red is an overlay of black guard hairs over a red coat. Belgian Tervurens are heavily sabled. Collies are generally more lightly sabled. 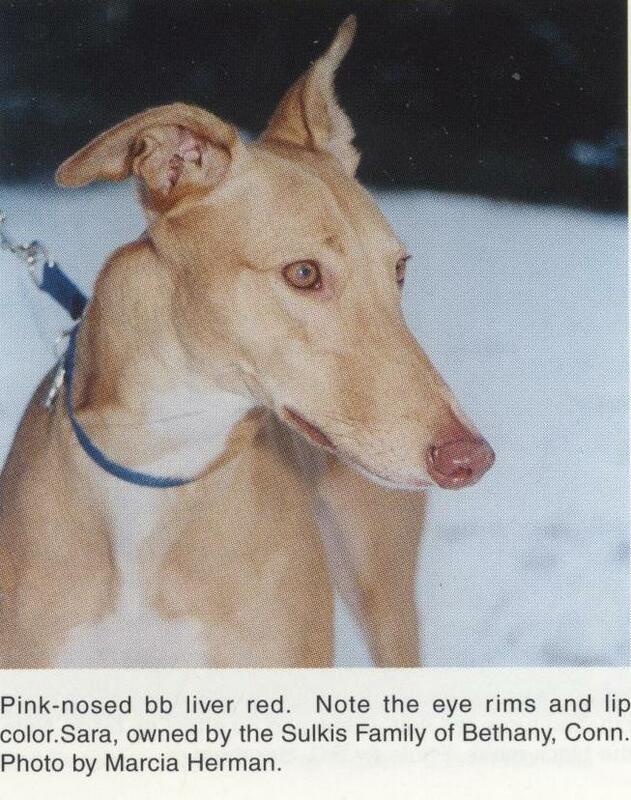 Most red greyhounds are sable reds. The easiest place to find the sable guard hairs is on the edges of the ears and the eyebrows, and black hairs will appear there in even very lightly sabled dogs. These black hairs are the test of whether you are looking at a sable red or an ee red. In heavily sabled dogs the black hairs also appear on the sides of the neck, the top of the head, the tail, and in the body coat. 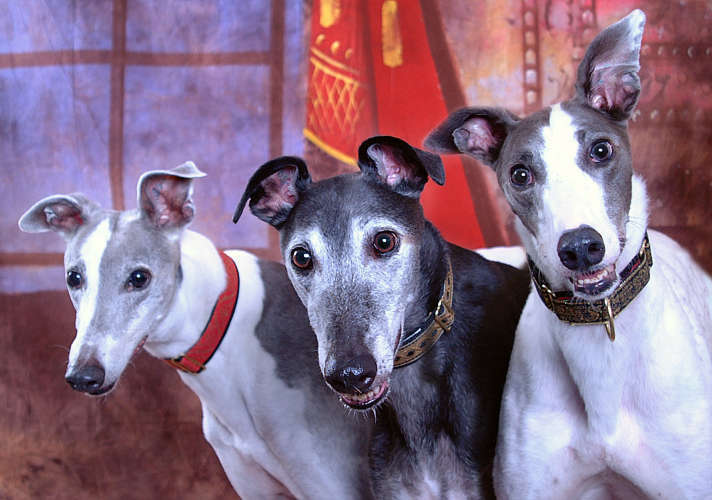 All greyhounds are either brindle or non-brindle. The dominant gene N produces brindling. So a dog that is either NN or Nn will be brindle. The recessive gene nn produces no brindling. And stripes add up. If a dog has two genes for brindling (NN) it will have more black stripes than a dog with a single brindle gene. 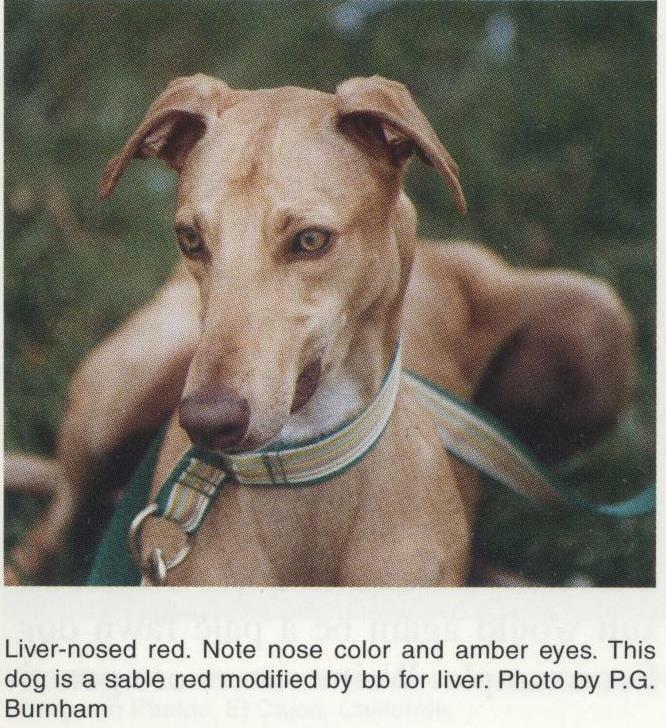 This is my first correction to Clarence Little’s book The Inheritance of Coat Color in Dogs (Howell Book House, 1967). He assigns brindle to the E location, but that is an error. Brindle can’t be on the E locus because the most recessive ee at that locus can conceal bridle by blocking the production of black pigment. The recessive ee would not be able to conceal brindle, if brindle were a more dominant gene on the same locus. There are five pairs of recessive genes and one pair of dominant genes that can modify the basic black, sable red or red brindle colors. The recessive modifiers are bb liver dilution, cch cch the paling gene, dd blue dilution, ee the black blocker, and si,sp,sw for white spotting. 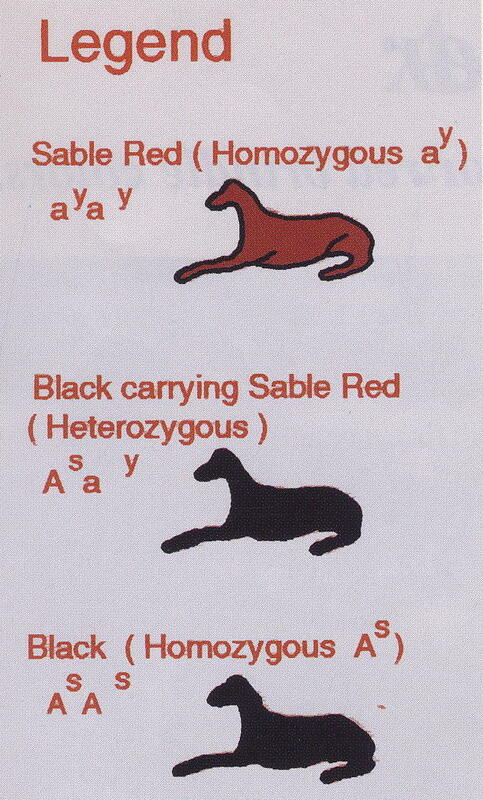 The dominant gene at each of these modifier locations (B,C,D,E and S) has no effect on the basic black, red brindle or sable red. It is the recessives at each location that modify the basic colors. So, let’s take them in order. The dominant CC or Ccch gives full pigmentation where red dogs look red. The recessive cch (ch stands for chinchilla) is the modifier that creates yellow fawns, silver brindles and other colors in which the reddish brown areas of sable reds, ee reds, and red brindles are lightened to yellow, cream or silver colors. This gene doesn’t affect black hair or black pigment and it doesn’t lighten eye color. 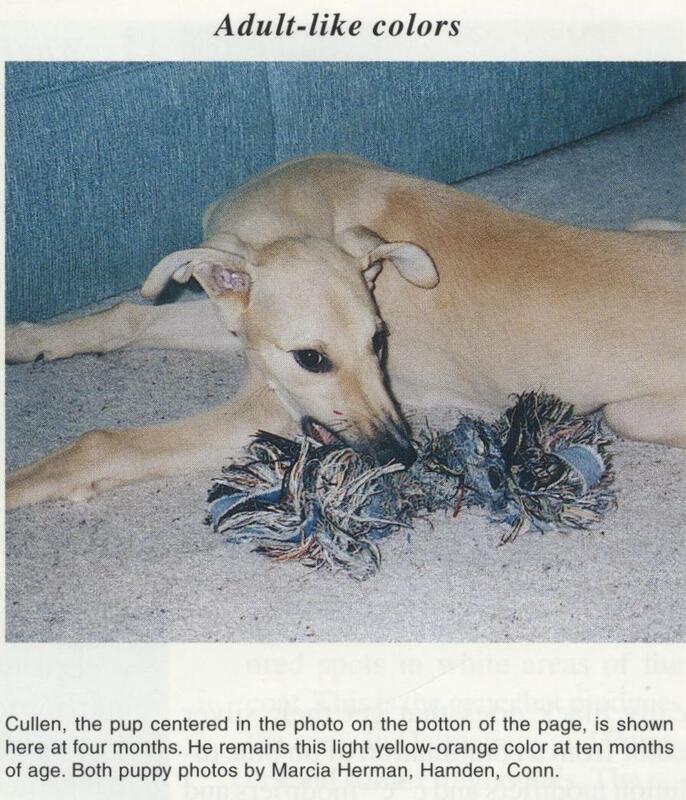 The paling gene cch is frequently seen in racing greyhounds (and show Whippets) and rarely seen in show greyhounds. Dominant DD or Dd allows black, sable red or red brindle color to remain unchanged. But the recessive dd combination modifies black hair color and pigment to blue (which is actually dark grey). Having two dd genes also changes sable red to blue fawn and red brindle to blue brindle. The dominant gene at this location EE or Ee allows black to be expressed in the dog’s coat (if other genes, like black, or brindle or red sable or masking, call for it.) But the recessive ee genes block the formation of black hair pigment even if black or brindle genes are calling for black hair. The dog will still have a black nose and eye rims but he won’t have a black hair on his body. There are a lot of breeds whose identification depends on their being ee. Golden retrievers, Irish setters, and weimaraners are ee and if they were EE or Ee they would be black because they are AsAs for black. What keeps them from being black are the ee genes that block the formation of black hair pigment. When a dog can’t put black pigment into its hair, it ends up red (or blonde) even if it has genes calling for brindle, or black, or black masking. The ee reds have rather a bald expression because they lack the dark eyebrows of a sable red. The ee gene has accounted for considerable confusion among greyhound color geneticists because of ee’s ability to conceal genes for black and brindle. 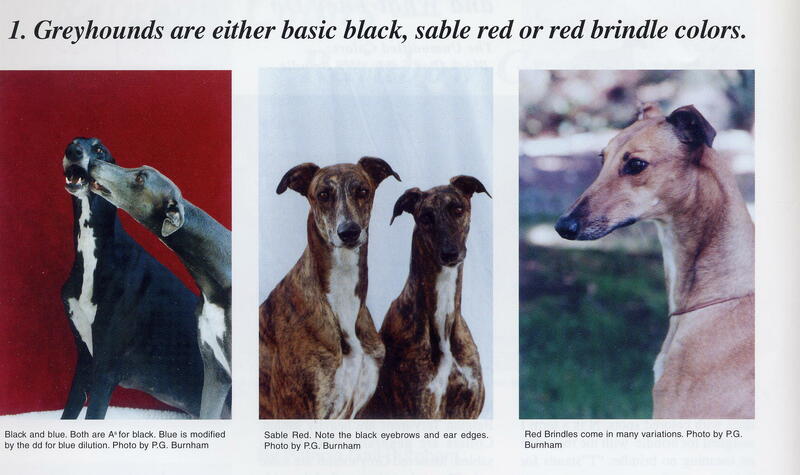 Most red greyhounds are sable reds ayay. Only a small number of greyhounds are ee reds. Two sable reds bred to each other will only produce more sable reds. And two ee reds bred to each other will only produce more ee reds. But when you breed an ee red that is masking a hidden brindle or black gene to a sable red who is EE or Ee you can get puppies that are Ee or ee. And since Ee will not block the production of black pigment, our two red parents can have puppies that are red, brindle or black, much to the owner’s surprise. 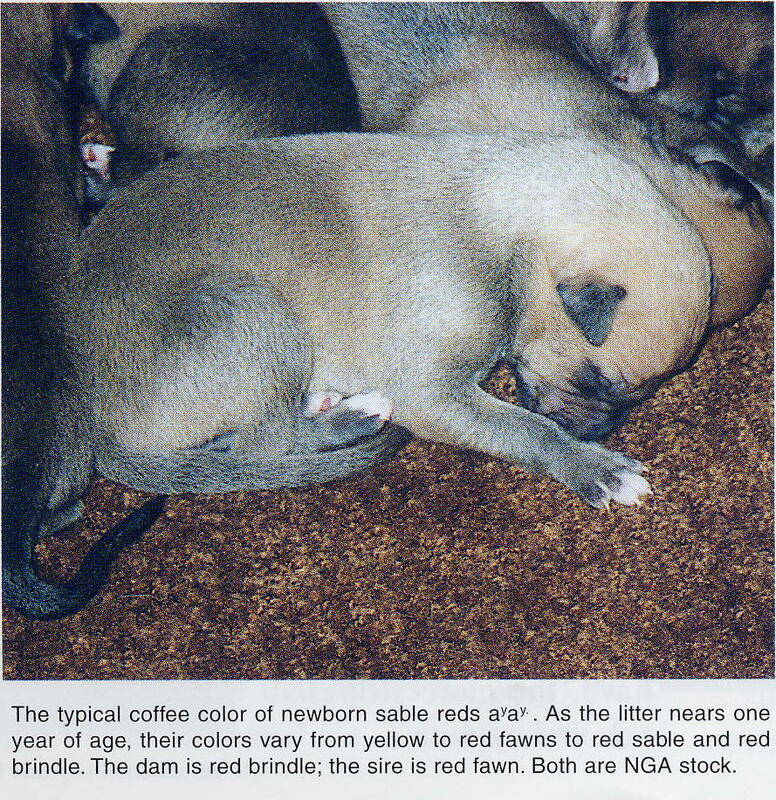 Extensive records of red x red greyhound breedings have always shown a small number of black and brindle puppies that show up among the expected red puppies. These are not due to owner error as some of the studies have said. They are due to one of the parents being ee red while the other is a sable red. The dominant S produces whole colored dogs that have only small areas of white on the chest, neck, and toes. The next gene si is called Irish spotting and it produces a dog with a white chest and neck ring and possibly white front legs. Basenjis and Collies have a lot of this pattern. The next most recessive gene sp is called particolor and produces a dog that is mostly white with colored patches on the head, rump, back and sides. The most recessive gene of this series sw is called extreme white spotting and produces a dog that is predominantly white with little head color (sometimes just colored ears) and small or no areas of body color. Extreme white spotting is connected with occasional hereditary deafness in dozens of dog breeds, the Dalmatian being the most famous. White hair color causes deafness because white hair is caused by the absence of pigment within the hair shaft. What a dog, or for that matter a person, hears with, deep in the inner ear, are modified hairs. Those hairs need color pigment to maintain their health. When the receptor hair cells atrophy there is no way for sound to be transmitted from the dog’s inner ear to its brain. In the case of ticking it is the dominant gene that causes the effect the locus is named for. The dominant T allows the production of small colored spots in white areas of the coat. This is the gene that produces the spots in Dalmatians and Pointers and some greyhounds. The recessive tt results in few spots in the white coat areas. The coat ticking is usually black but in the case of an ee red it would be red, and in a bb liver the spots would be liver colored. English setters are good examples of this. The genetic greyhound colors are: black; sable red; red brindle; liver; liver-nosed red; liver brindle; yellow fawn; yellow fawn brindle; blue; blue fawn; blue brindle; ee red; white; and white spotted with any of the above colors. What makes up the wide variety of greyhound colors is that one dog may have several different modifiers acting on his coat color. So a dog could be ayay for red, with modifiers for dd blue dilution, and cchcch for the paling gene and the result would be a pale fawn dog. Or a dog could be AsAs for black with modifiers for ee and cchcch and the result would again be a pale fawn dog. For example: Weimaraners are genetically black dogs that get their silver color from a combination of bb blue dilution modifiers and cchcch modifiers and Irish Setters are genetically black dogs that become red through the action of the ee modifiers. What can parents and offspring tell you about a dog’s genetic color? In order to chart colors on greyhound breedings you have to determine a whether a dominant colored dog carries the recessive genes. Any dog that produces a recessive colored puppy is proven to be a carrier for that recessive gene. Also any puppy from a recessive colored dog has to be a carrier for that recessive. When I bred Little Tiger to Sheena they were both red brindles. I knew that Little Tiger had to carry the recessive for particolor because his dam was particolor so she had to give him one of her particolor genes. I knew that Sheena had to carry blue dilution because her mother was blue and could only give her a blue dilution gene. When the litter was born it contained red brindles, blue brindles, sable reds, blue fawns and particolors. From those colors I knew that both Little Tiger and Sheena were carriers for blue dilution, white spotting, and non- brindle. Additional hints about genetic colors are that a whole colored dog with a lot of white on his chest, neck and toes is very likely carrying one gene for white spotting. Black brindles, which are red brindles with lots of black stripes, if they were born from more lightly marked red brindle parents, often received a brindle gene from each parent NN and all their offspring will be brindle. The more brindle genes you have, the more stripes you end up with. 1. Breeding two parents of the same recessive color together will produce only that recessive color. So two blue dilution parents can only produce blue dilute puppies. Two white spotted parents can only produce white spotted puppies. Two liver parents can only produce liver puppies. 2. If two non-recessive parents ever produce a recessive colored puppy, both parents must be carriers of the gene for that recessive. So if two red brindle parents produce a red, or a white spotted, or a liver, or a fawn, or a blue dilute puppy, then both parents are carriers for that recessive trait. 3. Two sable reds bred to each other cannot produce blacks or brindles. Likewise two ee reds bred to each other cannot produce blacks or brindles. BUT a sable red bred to an ee red can produce occasional blacks or brindles. Newborn greyhound colors are strikingly different from their adult colors. First time breeders are often baffled when identifying newborn colors. The only two greyhound colors that don’t change between birth and adulthood are black and solid white. Sable reds are born dark brown, strong coffee colored, and lighten to red in a few weeks. They nearly always have black masks when they are less than eight weeks old. Most black masks are gone by the time the puppy is an adult, but sometimes they keep the mask into adulthood. All the blue dilutes, that is blue, blue fawn and blue brindle are born a pale silver color and they are difficult to tell apart at birth. The solid blues, and the stripes on the blue brindles, will darken with time. The blue fawns will change to a rose grey color. All blue dilutes are born with pale blue eyes which darken with time. To identify the rare livers, look for liver nose pigment and eyes that tend to be greenish when young. Also the liver pigmented reds are born blond instead of coffee colored like the sable reds. The recessive ee reds are also born blond. They will have black nose pigment and their coat will darken and redden with time. The key to identifying an ee red is that they cannot have a single black hair on their body. Their eyebrows and ear fringes will not have the sable red’s identifying black hairs. Red brindles, like the sable reds, will lighten with time. As they grow their stripes get farther apart and the red ground color between the stripes lightens and reddens. 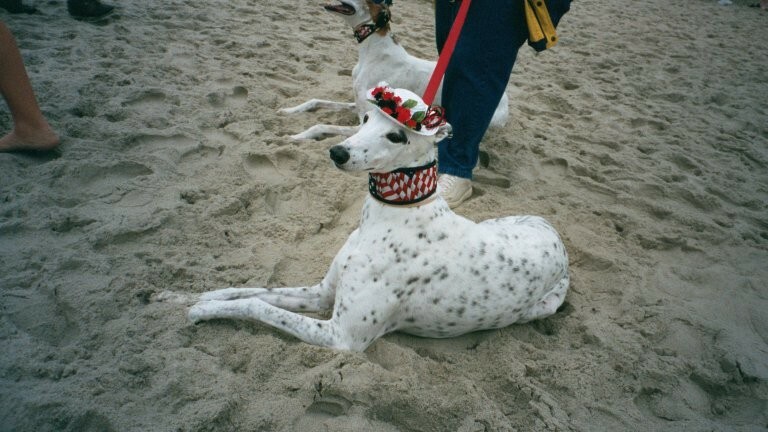 Greyhound folks tend to refer to white dogs as particolors. They rarely bother to distinguish between the true particolors and the extreme white spotted dogs. At birth they both often have pink noses, eye rims and foot pads which turn to black as the puppy grows.